I don’t know whether the reporter noticed the connection between headline and subtitle, but anyone who knows anything about crime prevention certainly did. I, too, reported on the two incidents (one & two), but out of order (i.e. the first event I learned of, and thus reported on, last) so I missed the proximity. Simply put: The students who, for several months were living with an impending criminal case over their heads did not commit any many major crimes. It follows, obviously, that several days after charges were dismissed they or their friends came back for another helping. #1 According to reports in your own blog the plaque was defaced few times over the last few months with criminal charges pending. #2 You can't realy scare people with criminal charges when they believe they are doing G-d's will.Study history especialy history of Chabad Lubavitch. #3 As the elected Gaboim of the 770 pointed out in the court papers one can't place a plaque on the wall of 770 with statements most of people in 770 see as against the Rebbe's teachings and excpect it to hang there undisturbed http://www.chabad.info/index.php?url=article_en&id=3694 . The bottom line of it that unity is important and is for the ultimate benifit of all involved. You are welcome to post English translation of the letter and your comments here. PS:What do you think this letter implies should be done as far as plaque on 770 cornerstone is concerned? Who is in charge in Chabad , or what's wrong with Moshiach flags? Look, you've all just demonstrated that your biases have twisted your rational judgment. 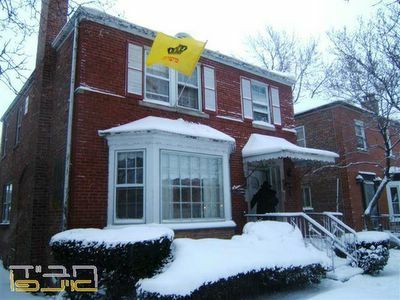 Now I ask again, and try to be rational here: What's so bad about putting Yellow flags on your house? Admittedly, I wouldn't do it, but what's so bad about it? I looked at the Moshiach Center website, and it looks like they run Moshiach programming. They're Mishichistim, so you don't like them. But, b'poel, it looks like they do programs that attempt to bring closer to the Rebbe and to the inyan of Moshiach. Their entire existence there is to discturb the Shluchim. Sure it looks good, until you know what they are up to -- undermining existing Chabad institutions in existence for 40+ years. "undermining existing Chabad institutions in existence for 40+ years." Very well said. That's what most of the tzfatim are doing. However to the extreme they are undermining the Rebbe. Rebbe King Moshiach Shalit"a made every Jew his Shaliach, he never created "protected teritories" for "official shluchim" he said in a sicha from 5747 every Chabadnik should put up a sign Chabad House on his home (see more on this with links here at the end of my bio http://torah.5u.com/aboutme.html, he said all Jews should welcome Moshiach publicize his identity and accept his kingship with joy. Oh wait, you're a ba'al teshuva who was never part of the Rebbes secretariat....But you seem to know what's going on...Ok, that makes sense. The Rebbe never said that every Lubavitcher must be botel to Aguch and or Merkos. The Rebbe left public orders for everyone willing to fulfill them. "Oh wait, you're a ba'al teshuva who was never part of the Rebbes secretariat....But you seem to know what's going on...Ok, that makes sense. " #1 One often gets a clearer picture when looking from the outside. #2 I met many on the inside who have the same views I do. How is this any differnt. Is it permited to ask questions thru Igros Koidesh ? A post in response to a Lubavitcher Chosid claiming it's not our custom to ask questions this way. Whoever quotes someone by name brings geula to the world.Quoting a source is not limited to Baaley Teshuvah it's proper behaviour in general. PS: The Shluchim who say it's forbiden to use Igros usualy use them themselves, but teach others not to use it since they are afraid that people will create anarchy thru improper understanding of the replies.